African morning? Never thought you'd here cold and African in the same sentence, huh? getting-out-the-door part that nearly kills me. a somewhat healthy and stinking delicious breakfast. things that are in my room from there}, other house stuff, and lots and lots of dishes. filled my room with the most amazing aroma ever. Thinly slice the apple and place in a mixing bowl. Add 1 tbsp. brown sugar, 1/2 tbsp. flour, and 1/8 tsp. cinnamon. Coat the apples with the dry ingredients and place in a small baking dish. Mix together the rest of the dry ingredients and the butter; put on top of the apples. Microwave for 60-90 seconds. 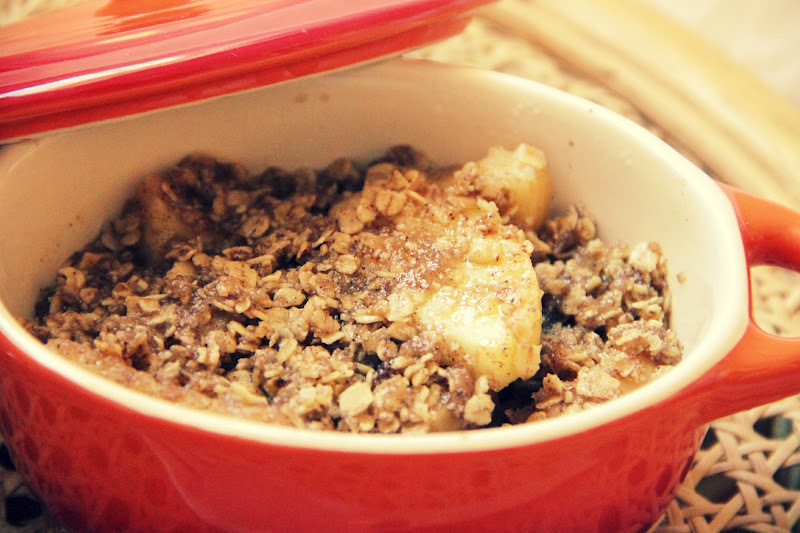 Check out some other single serving recipes! And I'd like to thank you all for coming on over! Learn a little bit more about The Baker! I'm so excited to get to know y'all! That is so fun, you turned a true classic into a single serve microwave dish! BRAVO! This looks fantastic. I love that it is a single serving and that you can make it in the microwave. I would love if you would share this and any other posts at Showcase Your Talent Thursday http://whatscookinglove.blogspot.com/2012/05/showcase-your-talent-thursday-8.html. I hope to see you there! 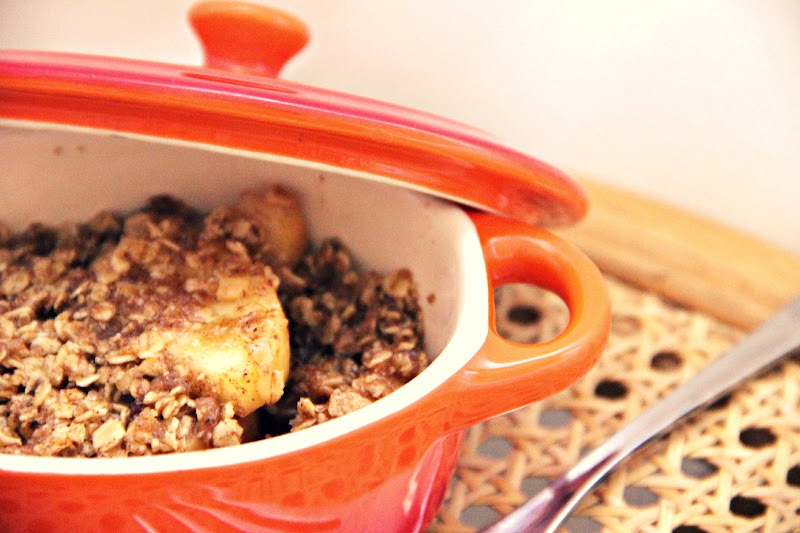 Mmmm your apple crisp looks delicious! One of my favorite desserts, especially in the fall! I have little individual serving dishes like that too, it's so fun to serve it to guests like that! I just made this and OMG it was AMAZING!! I will be eating this for breakfast regularly. thank you! I was a little skeptical at first. 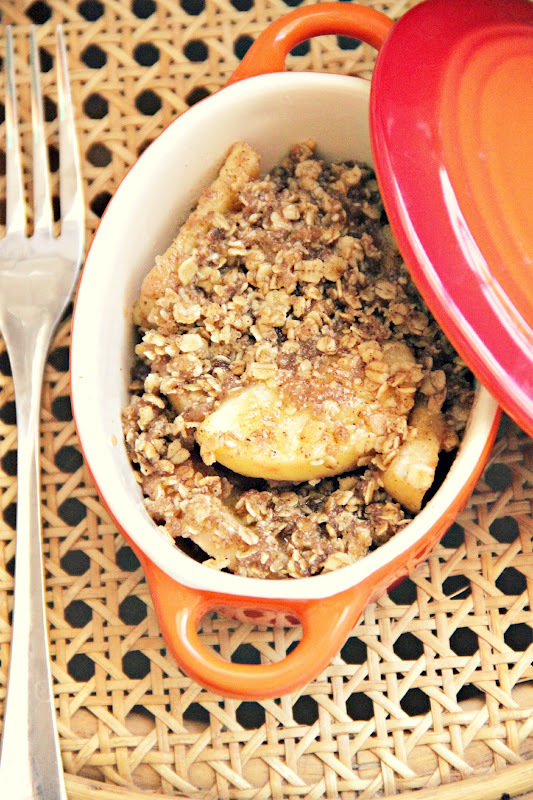 But I tried it since apple crisp is one of my fall favorites. Making a full apple crisp can be a little tedious...so I thought, what the heck? I'll give it a shot. I'm so glad I did. I'm definitely trying the other single-serve recipes soon! Keep on baking! I tried it and it was delicious!!!! This is delicious! My first success at a microwave recipe! :) Thanks! Your blog has made it to my "favorite blogs" list because of so many single serving recipes! I love it! I tried this one last week and I make it everyday since then. Delicious! Just made this! So yummy. Popped it in the oven though just to get that extra crispiness, maybe one day if I'm short for time I'll try the microwave version. Maybe I can serve this in bed to my parents! Just made this...WHOA!!!!!! Exceeded my taste bud's expectations. Halfway through, savoring every delicious bite. This is SOOO GOOD!!!! Is this microwaved covered or uncovered? Invaluable writing , Coincidentally , if people is looking for a service to merge two PDF files , my family saw a service here altomerge.com. It's helpful for every Individual. This recipe looked so good that I just had to try it! I have some dietary restrictions, so it's hard for me to find recipes that work for me, but this one checked all the boxes! When I made it, the whole family approved! Keep sharing such type information.